This antique engraved platinum wedding band has a romantic inscription from the 1920s. This thin wedding band measures a narrow width of 1.78mm and rises 1.25mm above the finger. 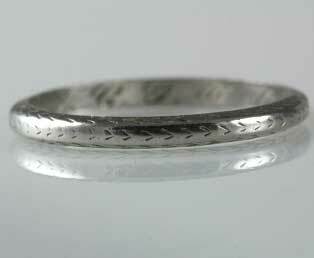 A tender date from the 1920s and initial inscription may be found on the interior of this wedding ring. Very good condition, exterior engravings have softened with time.